The traditional winery is located in the municipality Mertesdorf (Ruwer area) on the so-called Grüneberg in the German wine-growing region Moselle, According to a deed of donation of the Frankish king Dagobert I. (608-639) from the year 633 is attested that the Trierer Benedictine monastery St. Maximin already had at that time in Mertesdorf possession of buildings, vineyards and estates. This was then 966 by Emperor Otto I (912-973), the successor of Charlemagne (742-814) confirmed. Much of the vineyard was created later. Until 1802 Maximin Grünhaus was managed by the Benedictine Abbey. In the course of secularization under Emperor Napoleon (1769-1821) was the operation until 1810 under French administration. In this year bought after an auction, the first secular owner of the estate, which was then acquired in 1882 by the great-great-grandfather of the current owner. 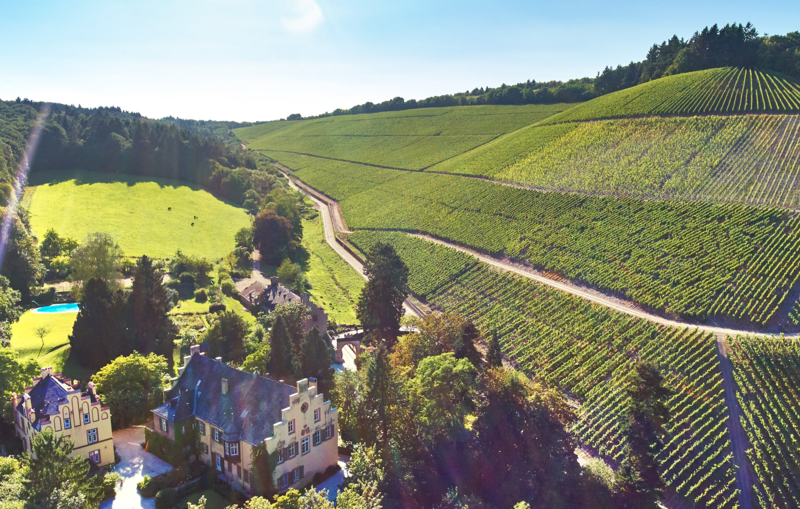 Since 1981, the estate is managed by Maximin von Schubert in the sixth generation of the family. The administrator and cellar master is Dipl. Ing. Stefan Kraml. The closed vineyard Maximin Grünhaus on the southern slope of the Grüneberg comprises a total of 34 hectares of vineyards. The name "Greenhouse" (on the Grüneberg) is probably derived from the here occasionally occurring veins of Diabas (greenstone), a marble-like greenish volcanic rock. In addition, the old monastery building was painted in green for centuries. The area consists of the three distinctly different in the soil structure individual layers Bruderberg, Herrenberg and Abtsberg. They correspond in terms of quality of monastic hierarchy brothers (wine for the simple monastery brother), canons (wine for the Maximiner canons) and abbot (wine of the abbots of the abbey of St. Maximin). All three are since 1882 in monopoly possession of the family. The oriented to the east to southeast Bruderberg in 140 to 170 meters above sea level with 50 to 70% slope Tilt covers only 1.1 hectares of vineyards exclusively with Riesling planted and marked by blue Devon slate. The wines are dominated by very spicy and rustic slate minerality. This part is located at the bottom and is crossed by a well-preserved Roman aqueduct. The south-east oriented Herrenberg at 190 to 290 meters above sea level with 20 up to 60% slope covers 19 hectares of vineyards on predominantly red Devonian slate, which is weathered to deep soil with good water management. The wines show early fruit and body and have an extraordinary viability. Riesling is also here Pinot Blanc cultured. The oriented to the southeast to southwest Abtsberg in 140 to 270 meters above sea level with 40 to 75% slope covers 14 hectares of vineyards on mostly blue Devonian shale. He was first mentioned in documents in 966. Viticulture was probably operated here but already in the fourth century. This part is located in a side valley of the Ruwer. The Abtsberg is considered the best quality of the three individual layers, where extremely long-lived wines grow. Here too Pinot Noir grown. The wines are characterized by a finely structured, subtle minerality, racy acidity and much fruitiness out. The wines are mostly with natural yeasts fermented spontaneously and in the cool cellars mostly in traditional big oak barrel expanded. The historical label shows the coat of arms of the von Schubert family and a view of Grünhaus with the vineyards. For the quality and Cabinet wines is a white-green capsule, from the predicate late vintage a long, black and white heraldic cap used. The winery is a member since 2016 VDP (Verband deutscher Prädikatsweingüter). This page was last modified at 13 September 2018 at 16:13.